Figure 1: 2D μ-XRF element maps (Ca, Fe and Zn) for the unexposed and exposed D. magna. What is the effect of transition metals on the health of freshwater invertebrates? One problem is to determine the concentration of trace-level distributions within the organs of the animal, which is the size of a few mm in the case of a typical model system – the water flea Daphnia magna. The combination of 2D/3D fluorescence micro-probe and X-ray absorption tomography allows creating a detailed map of metal concentrations within the invertebrate. This non-destructive method allows a qualitative determination of metal-distribution within the different organs of the invertebrate, which can be used for scientifically based environmental regulations. One problem in environmental toxicology is to define scientifically relevant environmental regulations, which are based on accurate biotic ligand models. These models are used to predict the toxicity of pollutants in surface water on living organisms like pelagic and benthic invertebrates. In order to develop these biotic ligand models [1,2], toxicological effects and accumulation of pollutants in various organs of the organism have to be measured. The freshwater crustacean Daphnia magna is one model organism to study the effect of transition metals like Fe, Ni, Cu, and Zn on various organs. The size of daphnids is rather small with a length of 1-4 mm, which makes it difficult to use conventional methods like dissection and acid digestion of various organs, which remains are then studied with atomic absorption spectrometry. Other methods cannot distinguish between whole-body accumulation and accumulation within specific organs, which is important to determine the organ-specific accumulation and toxicity. Micro X-ray fluorescence techniques, such as fast 2D mapping, 2D computed tomography and 3D confocal imaging are ideal non-destructive tools to study trace-level distributions of metals in small biological samples. The high intensity of synchrotron radiation allows measuring fluorescence maps with resolution of 5-20 μm within a few hours. Despite the high flux, radiation damage of the organism is negligible. 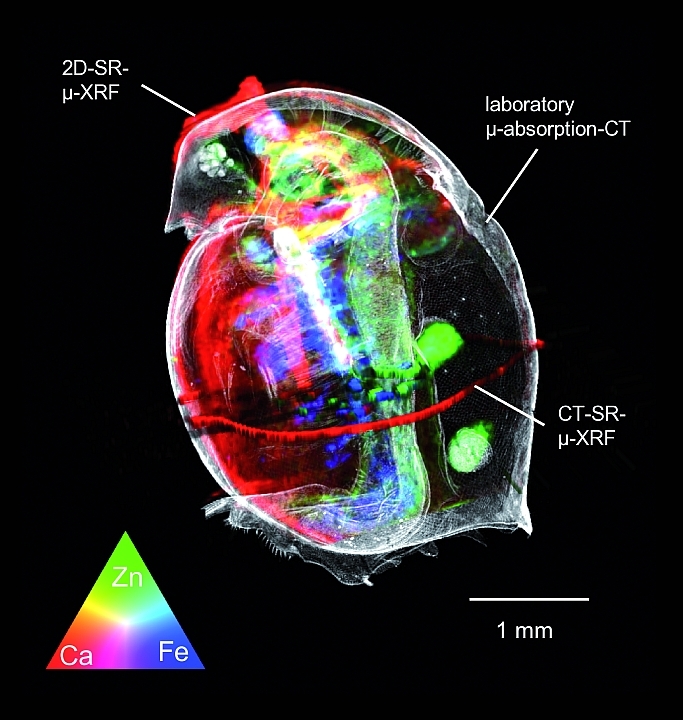 We combined data of 2D/CT high-resolution fluorescence maps with X-ray absorption computed tomography rendered volumes, in order to compare the metal concentrations in Daphnia magna which were kept in aquatic environments with normal and elevated Zn concentrations. These comparisons show enrichment of Zn in specific organs (e.g. gill and eggs), which give important information about ingestion and accumulation of Zn in Daphnia magna. Figure 1 illustrates two-dimensional scanning micro-XRF results showing the elemental distributions within two Daphnia magna samples corresponding to different levels of aquatic Zn exposure. These scans were performed at Beamline L of the DORIS III storage ring. The elemental maps correspond to the Ca, Fe and Zn distribution within an unexposed sample (left), and within a sample which was exposed to 120 μg L−1 Zn for 1 week (right). Since metals can only infl uence physiological processes where they are effectively present, insight into the tissue-specific distribution of elements contributes to an increased understanding of possible consequences of an exposure . The accumulation of Zn in the different tissues is clearly visible. A colour bar, which gives the areal Zn concentration in micrograms per square centimetre for both samples, is given on the right. A distinct enrichment of Zn can be observed in (A) the gill-like osmoregulatory tissue, and in the digestive system, i.e., (B) the gut and (C) the digestive gland. The accumulation in gills may suggest that zinc accumulation may interfere with osmoregulation (as in fish). The accumulation in the digestive system may suggest that nutrient assimilation from food is a possible Zn toxicity target. Figure 2 shows the result of the “cross-fertilization” between laboratory X-ray absorption microtomography and SR micro-XRF techniques (2D dynamic scanning and XRF computed tomography). The measurements were complemented by absorption CT measurements at the UGCT micro/nano-CT set-up at Ghent University. The reconstructed 3D image allows a thorough investigation of the tissue structures and their corresponding elemental contents. The colours red, green, and blue are the scaled Ca, Zn, and Fe intensities, proportional to the elemental concentration. A colour triangle at the left bottom of the image renders the colours which indicate the correlating or complementary behaviour of the elements in question. The very distinct accumulation of Ca in the exoskeleton, Fe in the gilllike tissue, and Zn in the gut and eggs can be clearly observed. The illustrated research demonstrates the potential of combining ecotoxicological experiments with X-ray techniques which can both visualize the elemental composition and structure of biological samples on the microscopic scale. With respect to biological imaging, shifting from the microscopic tissue scales towards a subcellular field of view is expected at PETRA III. 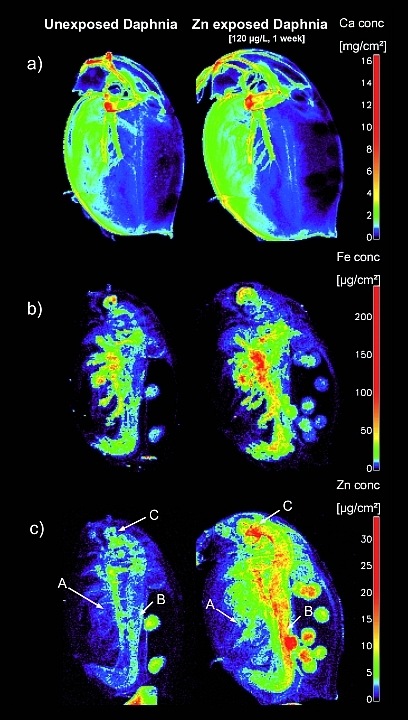 Using nanobeams of X-rays coupled with state-of-the-art scanning systems and multi-element detectors, a detailed 3D structure of the elemental distributions within individual cells will be detectable, which is likely to provide new insights into the role of metals in cell biology. P. Paquin, J. Gorsuch, S. Apte, G. Batley, K. Bowles, P. Campbell, C. Delos, D. Di Toro, R. Dwyer, F. Galvez, R. Gensemer, G. Goss, C. Hogstrand, C. Janssen, J. MCGeert, R. Naddy, R. Playle, R. Santore, U. Schneider, W. Stubblefield, C. Wood and K. Wu, Comp. Biochem. Physiol. C. "Pharmacol. Toxicol", 133, 3-35 (2002). D. Heijerick, K. De Schamphelaere and C. Janssen, Environ. Toxicol. Chem., 21, 1309-1315 (2002).